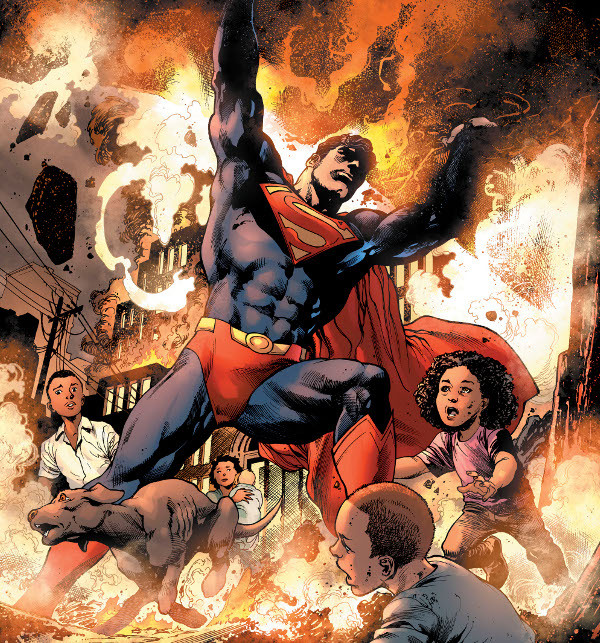 Following up the pair's six-issue mini-series The Man of Steel, writer Brian Michael Bendis and artist Ivan Reis begin their run on the new ongoing Superman title. Superman #1 re-introduces readers to Superman's world, offers the creation of a new Fortress of Solitude, and includes cameos of Justice League members checking in after recent events. There are several little gems in this issue, but I think my favorite might be the short discussion between Superman and the Martian Manhunter. During J'onn's plea for Superman to taking a more active role in the leadership of Earth, Superman keeps bowing out to solve some issue or another halfway around the world (but always giving J'onn 99% of his attention when he returns). A great illustration of Superman jumping into action whenever needed, it offers interesting argument from the Martian while still showcasing Superman's modesty in the face of what he can do and what is asked of him. The issue ends in a cliffhanger that suggests Superman's victory of Rogol Zaar may have been premature. I'll be curious to see just what more is revealed in issue #2. Worth a look.